Solve the most pressing challenges facing children and families today by connecting scholarship and practice through the M.Ed. in Child Studies. There are two tracks in this program — an Applied Professional Track if you plan to work directly with children and families and a Clinical and Developmental Research Track if you plan to apply to a doctoral degree program later. Both tracks prepare you to work as a practitioner or researcher with expertise in skillfully applying developmental research to real-world problems. Cohorts are small with about 20 students, and students who succeed in the two-year Child Studies graduate program are passionate about improving the lives of children and families through professional and research roles in schools, community service organizations, nonprofit and research institutions, and universities. The program combines traditional classroom preparation with practicum experiences or clinical or developmental research mentorships, depending on your chosen career path. It will prepare you for applied careers or strengthen your training for doctoral study in clinical, developmental, or other areas of psychology. Applied Professional Track—for students interested in careers working directly with children and families. Through this track, you’ll be matched with relevant agencies and and community organizations to gain hands-on field experience in applying current research toward improving outcomes for children and families. 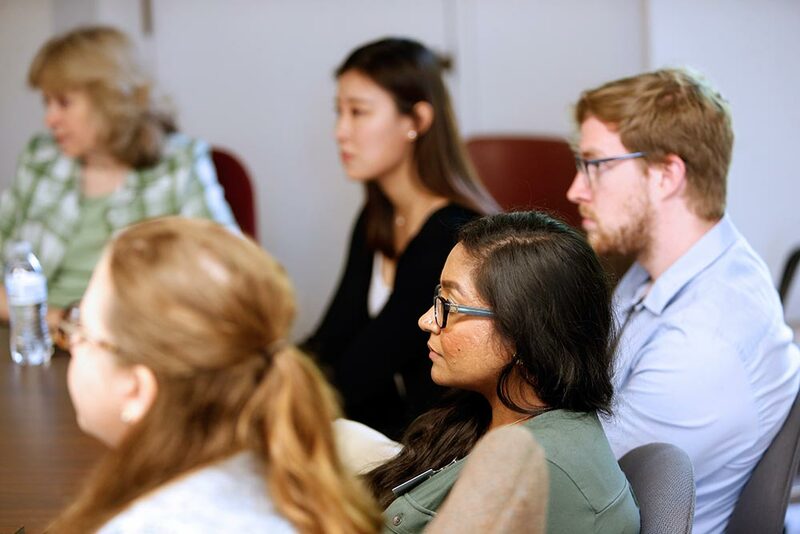 Clinical and Developmental Research Track —for students interested in pursuing doctoral study in clinical, developmental, educational, cognitive, or other areas of psychology. Through this track, you’ll be matched with a faculty mentor and provided opportunities to participate on a clinical or developmental research team and develop your own interests and publication record to prepare for doctoral study or a career in research. You’ll pursue a range of interests through either track that includes the study of the intellectual, emotional, social, and physical development of children and adolescents. The M.Ed. in Child Studies program does not result in licensure as a counselor, therapist, or teacher. However, you may wish to use the program as a foundation for pursuing such licensure or preparing for related doctoral studies. Through either track, you’ll complete elective coursework according to the program guidelines and your selected area of concentration. This list of courses is flexibly developed with your advisor based on your professional and academic goals. Some areas of concentration are interdepartmental and may have specific additional requirements as determined by the respective departments. 98% of Child Studies graduates were employed or attending graduate school within four months of graduation. Assistant Clinical Director & Family Architect, Cognition Builders, New York, N.Y. Behavior Therapist, Carolina Center for ABA and Autism Treatment, Fayetteville, N.C.
Child Life Specialist Fellowship, Detroit Medical Center, Detroit, Mich. Early Learning Center Teacher, Martha O'Bryan Center, Nashville, Tenn.
Literacy Coach, McNeilly Center For Children, Nashville, Tenn.
Ph.D. Candidate, Educational Neuroscience, Vanderbilt University, Nashville, Tenn.
Pre-First Classroom Teacher, The Gardner School, Nashville, Tenn.
Child Life Specialist, Monroe Carell Jr. Children's Hospital at Vanderbilt, Nashville, Tenn.
Ph.D. Candidate, Clinical Psychology Oklahoma State University, Stillwater, Okla.
MSN Student, Psychiatric-Mental Health Yale University, New Haven, Conn.
Ph.D. Candidate, Clinical Psychology Virginia Commonwealth University, Richmond, Va.
As a Master of Education (M.Ed.) in Child Studies student, you’ll apply what you learn in the classroom to either a field-based placement or as a member of a clinical or developmental research team, engaging in hands-on work with children, adolescents, and families. Through the Applied Professional Track, you’ll be matched with a community site based on your interests and career goals, a process facilitated by program advisors in the semester before your placement. Placements may last one or more semesters, based on your progress and objectives. The nature of the 10 hour/week commitment varies significantly depending on your specific site. You may work in such endeavors as developing community programs, providing developmental interventions, or writing educational curricula. Regardless of site, your work will be informed by evidence-based practice. In conjunction with your field placement position, you will take two semesters of PSY-PC 7950: Child Development Practicum: Applied Professional Track. "My field placements have given me exposure to what it is like to work in various educational settings, helping me to narrow and refine my own career goals." Through the Clinical and Developmental Research Track, you’ll be matched with a research lab and faculty mentor based on your interests and lab availability. Program advisors facilitate this process during the summer session before your first fall semester. The research lab placement is intended to last for the full duration the program to allow you to develop in your chosen area of clinical or developmental research. The 10 hour/week commitment typically requires you to attend research lab meetings, participate in ongoing research projects, conduct reviews of relevant literature, engage in general professional development activities, and prepare conference-ready posters or presentations and/or publication-ready articles and manuscripts. In conjunction with your research lab position, you’ll be required to take two semesters of PSY-PC 7951: Child Development Practicum: Clinical & Developmental Research Track. The 36-hour program consists of 12-18 credit hours of Core Curriculum Coursework and 18-24 credit hours of Elective Coursework that are individually tailored to your personal interests and professional goals. In addition to the required courses, you’ll integrate child development research and theory with effective practice through a range of field experiences. Through these experiences, you will develop expertise as consumers and producers of scholarly research. Applicants to the M.Ed. program should have taken these courses or their equivalents during their undergraduate program or before applying for the M.Ed. in Child Studies. You will be required to complete 12-18 credit hours of core curriculum classes for the M.Ed. in Child Studies. The exact sequence varies depending on the track you select. Graduate course requirements for Vanderbilt 5th-year students and external master's applicants are identical. You are required to complete 12 credit hours of elective classes. An additional 12 credits are completed through individualized elective courses that are consistent with your professional and academic goals. These are selected according to your interests and area of concentration. An additional 6 credits are completed through individualized elective courses that are consistent with your professional and academic goals. These are selected according to your interests and areas of concentration.